1. 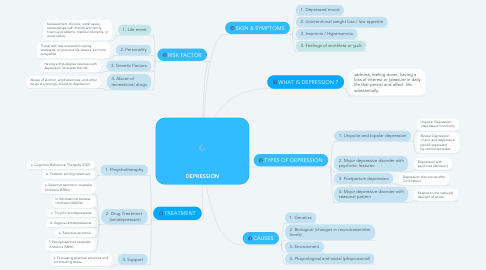 WHAT IS DEPRESSION ? 1.1. sadness, feeling down, having a loss of interest or pleasure in daily life that persist and affect life substantially. 4.1.1. bereavement, divorce, work issues, relationships with friends and family, financial problems, medical concerns, or acute stress. 4.2.1. Those with less successful coping strategies, or previous life trauma are more suceptible. 4.3.1. Having a first-degree relatives with depression increases the risk. 4.4.1. Abuse of alcohol, amphetamines, and other drugs are strongly linked to depression. 5.3.1. a. Discussing practical solutions and contributing stress.